WASHINGTON — The smaller crew complement on the International Space Station created by last month’s Soyuz launch abort has not affected research activities there or plans to send new experiments on upcoming cargo missions. 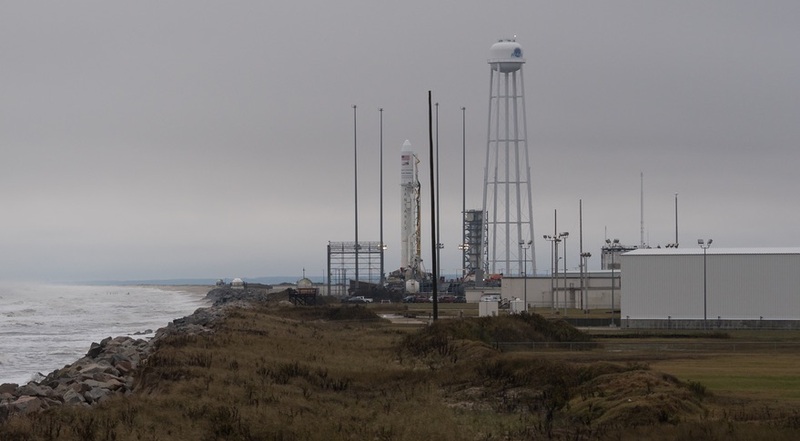 A Northrop Grumman Cygnus spacecraft is scheduled to launch to the station early Nov. 15 on the company’s Antares launch vehicle from the Mid-Atlantic Regional Spaceport on Wallops Island, Virginia. Preparations for the launch are on schedule, but forecasts project only a 30 percent chance of acceptable weather because of clouds and rain. That Cygnus is carrying more than 3,400 kilograms of cargo for the ISS. That includes a little more than 1,000 kilograms of science investigations, ranging from a protein crystal growth experiment to a 3D printer that is capable of recycling plastic materials into feedstock used to print new items. That research will be carried out by a smaller crew than originally planned. While NASA expected five people to be on the station at the time of the Cygnus launch, only three are currently there because of the Oct. 11 aborted launch of the Soyuz MS-10 spacecraft carrying NASA astronaut Nick Hague and Roscosmos cosmonaut Alexey Ovchinin. In the immediate aftermath of the accident, NASA advisors and others involved in ISS utilization expected there would need to be some adjustment to station research activities because of the reduced crew size. “That is now up for replanning, obviously, because it was dependent on five crew members being on board and what those crew members would do,” said Susan Helms, a former astronaut and current member of the Aerospace Safety Advisory Panel, of ISS research plans during a panel meeting Oct. 11. However, agency officials say that ISS research is continuing with little change a month after the accident. “We are still meeting record crew time hours. We haven’t needed to readjust the research planning purely associated with the decrease in crew size,” said Tara Ruttley, associate chief scientist for microgravity research in NASA’s Office of the Chief Scientist, during a Nov. 13 briefing at NASA’s Wallops Flight Facility. She added that the reduced crew had not led NASA to change any of the research payloads flying on the Cygnus mission. There are also no plans to change the payloads flying on the next SpaceX Dragon mission to the station, scheduled for launch no earlier than Dec. 4. By the time of the Dragon launch the station’s crew will be temporarily back to six people with the scheduled Dec. 3 launch of the Soyuz MS-11 spacecraft carrying NASA’s Anne McClain, Roscosmos’ Oleg Kononenko and David Saint-Jacques of the Canadian Space Agency. However, the three people currently on the station — Alexander Gerst of ESA, Serena Auñón-Chancellor of NASA and Sergey Prokopyev of Roscosmos — will return to Earth on the Soyuz MS-09 spacecraft Dec. 20. The station will remain with a three-person crew from the time of the Soyuz MS-09 departure until the next Soyuz mission is launched to the station, currently expected in April.